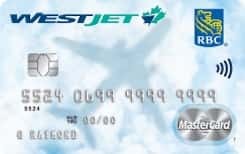 1% in WestJet dollars for every $1 spent on the card. 1.5% in WestJet dollars for every $1 spent on the card for WestJet flights or WestJet Vacations‡ packages. $50 WestJet dollars as a welcome bonus when you make your first purchase with the card. Every WestJet dollar is worth $1 Canadian toward travel with WestJet or WestJet Vacations. Use your WestJet dollars just like cash towards all or part of your next WestJet flight or WestJet Vacations package* - whenever you want, wherever WestJet flies. Save - even on WestJet seat sales. This CAD currency 85 is issued by RBC Royal Bank and runs on the MasterCard Network. The purchase interest rate for this credit card is: 19.99 percent annually and the transfer balance interest rate is: 21.99% per year. Also the cash advance rate is: 21.99% per year. Travel cancelation is Not available for this credit card and also travel accidents are Included.